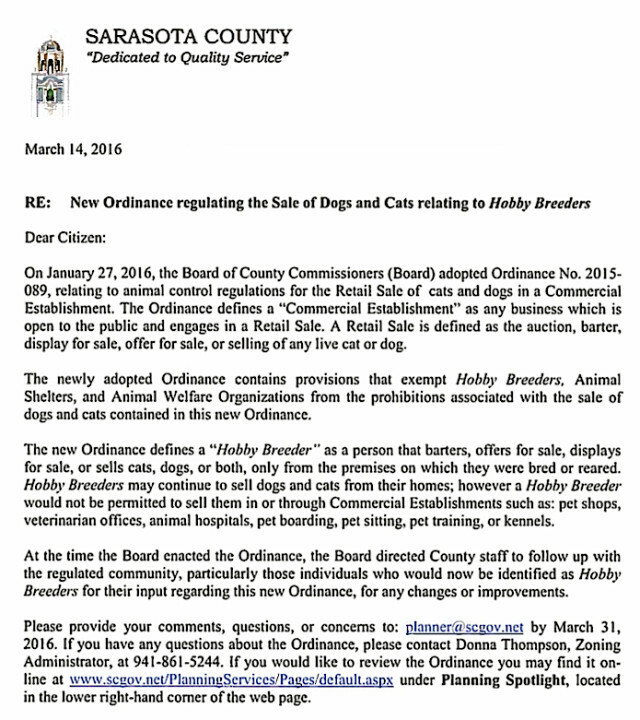 Not only are veterinarians concerned about violating the new Sarasota County ordinance banning the retail sales of dogs and cats, but more confusion also has arisen among breeders of purebred animals as a result of their receipt of a letter from county staff about the law, a county commissioner told her colleagues this week. 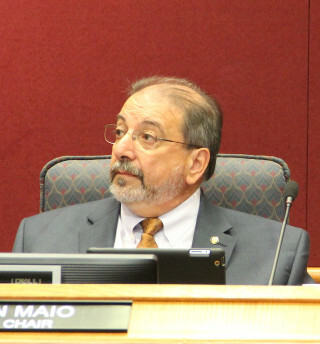 With the consensus of all the board members, County Administrator Tom Harmer said he would ask staff to contact groups such as the Manatee Kennel Club and other large organizations of breeders to schedule presentations to them as well as to proceed with conducting public meetings as planned in North and South county to educate people about the law. Commissioner Christine Robinson brought up the worries of veterinarians during the board’s regular meeting on April 12. She also reiterated concerns she had raised prior to the passage of the new ordinance on Jan. 27: that staff had not undertaken sufficient outreach to all the people who potentially might be affected by the law, especially breeders. The ordinance was created after community residents and nonprofit groups urged the county commissioners to prohibit the sales of animals born in abusive “puppy mill” situations. Robinson and Commissioner Carolyn Mason voted against the new law. 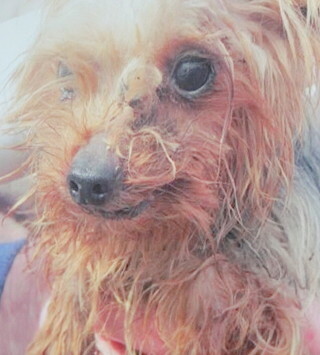 On April 12, Robinson explained that a veterinarian had told her that during the 15 years the veterinarian has been in practice in the county, “she’s been finding homes for patients’ animals” when patients had to give up the pets because of the people’s health concerns or relocations out of state to be closer to other family members, for example. The veterinarian has been charging “a nominal fee for a full physical” and administrative costs related to the handling of each animal before it went to a new owner, Robinson added. The veterinarian believes she no longer can do that after reading the ordinance, Robinson continued. Facilitating such adoptions is common among veterinarians, Robinson pointed out. Chair Al Maio agreed, noting that he has a family member who works in a large veterinary practice. In her reading of the ordinance, Robinson noted, she had to concur with the veterinarian’s view. Yet, she continued, “I can’t imagine a situation where a vet wouldn’t be better qualified than an actual … nonprofit” in finding good homes for pets. Was this situation an unintended consequence of the new ordinance, Robinson asked her colleagues. Vice Chair Paul Caragiulo also concurred that the board did not intend to prevent veterinarians from continuing such efforts. Then Robinson raised the issue of the letter staff mailed on March 14 to all entities that might be affected by the new law. The letter, according to a report to the commission dated April 4, went to as many organizations, associations, pet stores, veterinary offices, animal hospitals, pet groomers, training facilities, pet resorts and breeders as staff could find in the county. The list staff compiled was derived by using a national business database and putting in the keywords “pet,” “dog” and “cat,” the report explains. Staff also sent the letter to all businesses represented by speakers who made public comments to the commission on Jan. 27, the day it approved the ordinance. Robinson said she “took the liberty of calling four random folks” on the list to talk about their impressions of the letter. “It took about 45 minutes per call,” she added. Moreover, Robinson said, constituents have told her that they have contacted county staff with questions about the ordinance, but they have encountered difficulty in getting responses. “I think that’s a good idea,” Hines said in regard to more staff education of the public. Staff needs to make it clear that the board, in passing the law, let it be known it is “not in favor of speculatively breeding for profit,” he added. Making purebred animals available for families and making sure breeds survive are goals of the commission, he pointed out. “We are asking [breeders] to come to us instead of us going to them,” Robinson reiterated her earlier comment. Caragiulo agreed with her suggestion for staff presentations to specific, large groups of breeders, such as members of the Manatee Kennel Club. “But I also don’t want to turn this into a multi-year [process],” he added. Perhaps Robinson could provide staff with contact information for the kennel club and some of the other groups, including a local veterinary medical association, Hines said. “Is that a satisfactory approach right now?” Maio asked Robinson. “I’m fine with it,” she replied. 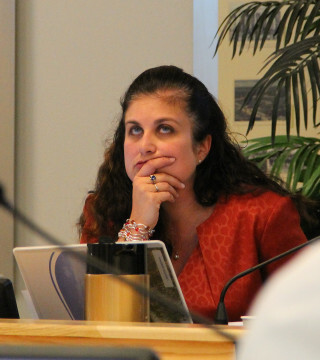 “I see five people nodding in consensus,” Maio told Harmer.